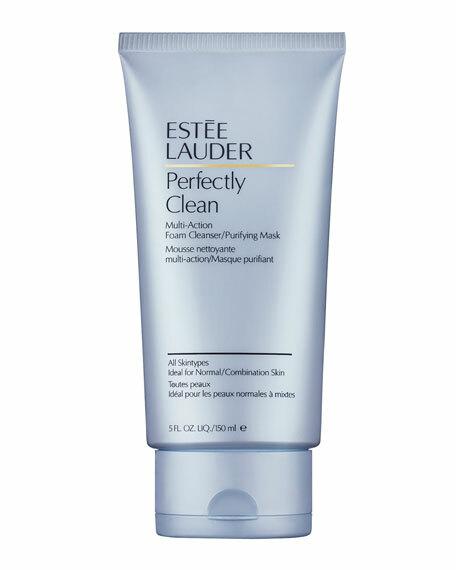 Estee Lauder Perfectly Clean Foam Cleanser/Purifying Mask, 5.0 oz. Estee LauderPerfectly Clean Foam Cleanser/Purifying Mask, 5.0 oz. Treat your skin with this deliciously refreshing foam that gently, yet thoroughly, cleanses and rebalances. Powered by proprietary technology, this creamy formula rapidly lathers into a rich foaming cleanser that works for all skin types and is ideal for normal/combination skin. Gently removes makeup and other impurities. Unclogs pores. Leaves skin healthy, fresh and luminous. Use it 2 ways: morning and night as a daily cleanser to purify skin, or use it twice a week as a 3-minute purifying mask. A nighttime moisturizer, with antioxidants and now 2X pomegranate concentrate, for 24-hour hydration and plumped, glowing skin? ?also works a mask.